125 records found. Page 2 of 13 displayed. At this time of year, you've got to grab every possibility. On 11 January , Mike Harper reports "WIth a forecast of foggy valleys and clearing a sky I decided to go up Red Pike today. It turned out that I wasn't the only one as I bumped into Malc in Buttermere who had the same plan. The day didn't turn out quite as forecast, with a layer of cloud covering the top of the hill. 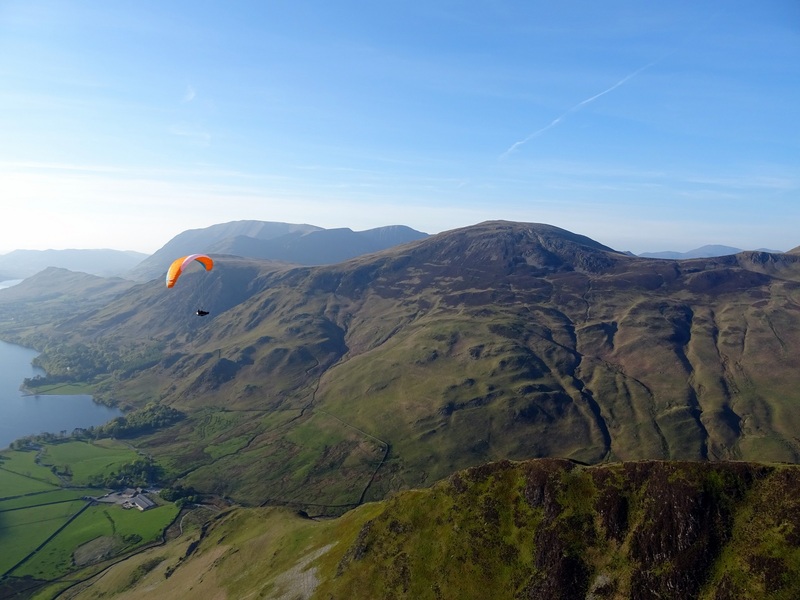 Despite this we had a nice smooth flight, initially keeping an eye on the footpath below us before the visibility improved once we'd passed over Dodd." 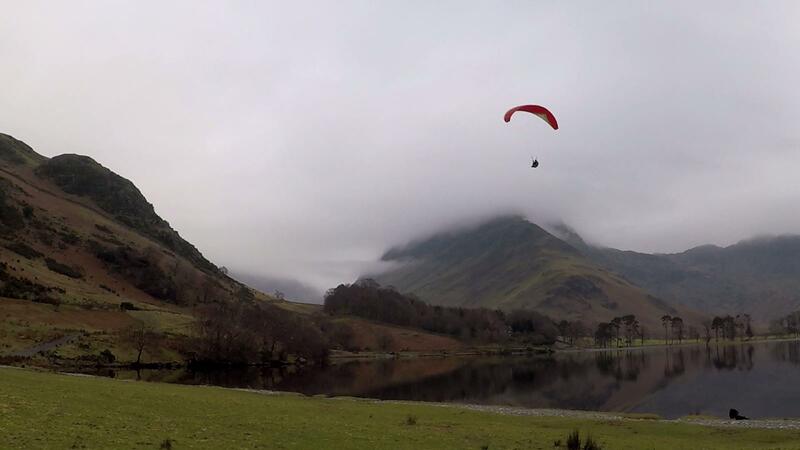 Here Malcolm Grout comes into land at the SE end of Buttermere. Fleetwith Pike is in the centre of the photo. 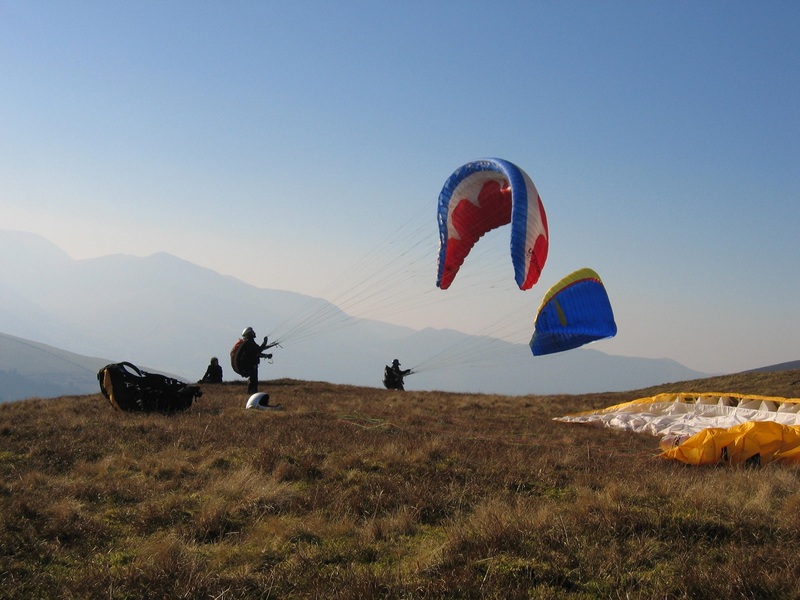 Wednesday 8th November looked like it would provide the opportunity for flying at Jenkin Hill around the middle of the day before the wind got too strong. 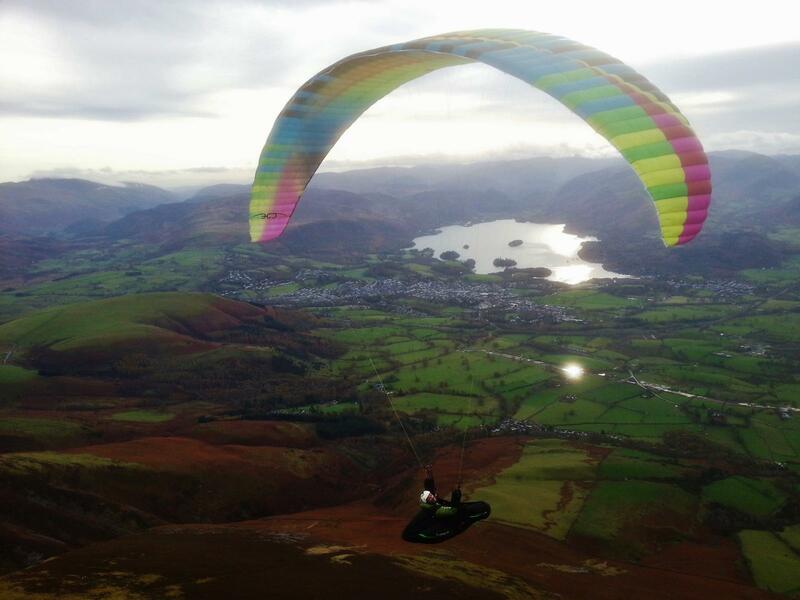 The picture shows Corentin Lami flying his BGD Cure, looking out towards Keswick and Derwent Water. 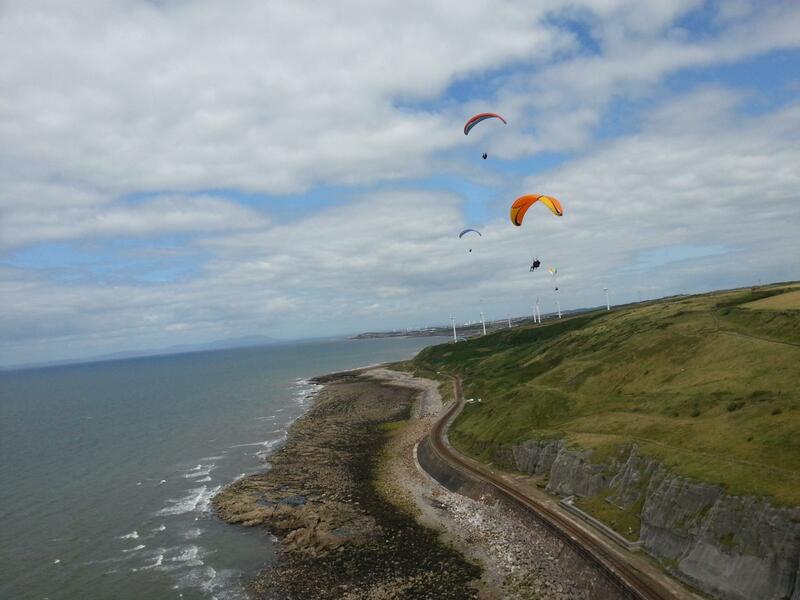 At the end of the flight as the wind picked up the glide back to the Flight Park was slow going. Photo by Malcolm Grout. Ed Cleasby took this "selfie" on Thursday 28 September. After taking off from Jenkin Hill, Ed decided to go east and was rewarded with a flight to Southwaite services on the M6. Souther Fell is immediately behind Ed with the Blencathra/Skiddaw massif behind that. 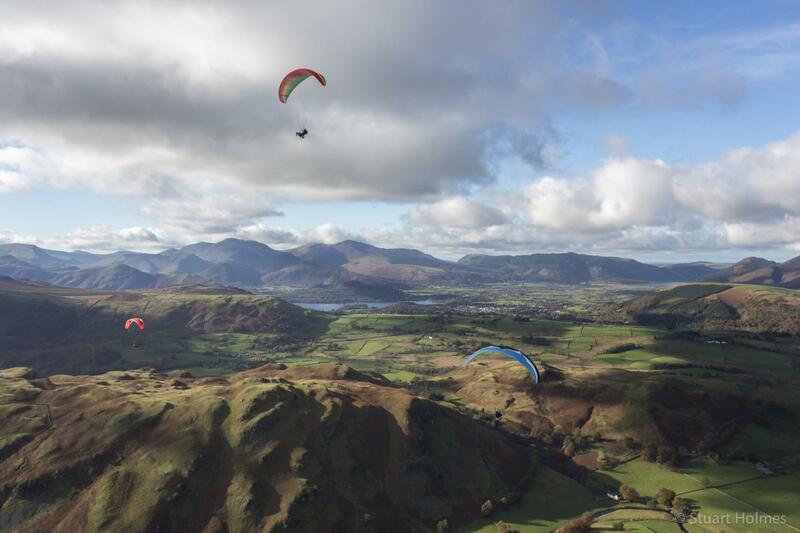 Ed reports that "this was the best looking day for ages" - it's been a wet summer! 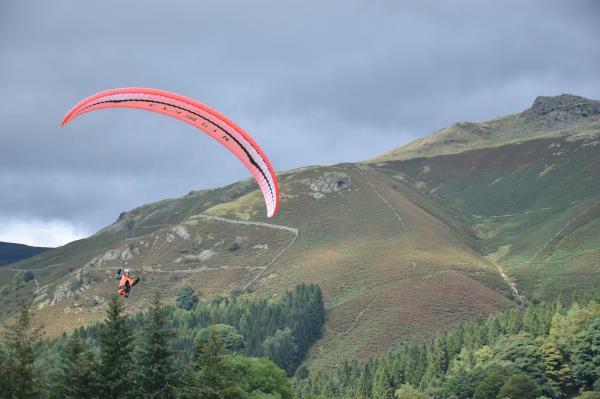 August is the CSC "Accuracy" competition month which we hold in Grasmere adjacent to the Grasmere Sports event. Here Richard Bungay comes in on finals to clinch the top prize with a 2.2m score. Stone Arthur is in the background and the date was 27 August. No photos submitted this month so its back to 2011 for this month's picture. June 2017 has been a month of varied weather; strong winds at the beginning of the month, heat in week 3 and endless rain in week 4. In 2011, this photo was taken to the east of Kirkby Lonsdale in SE Cumbria. 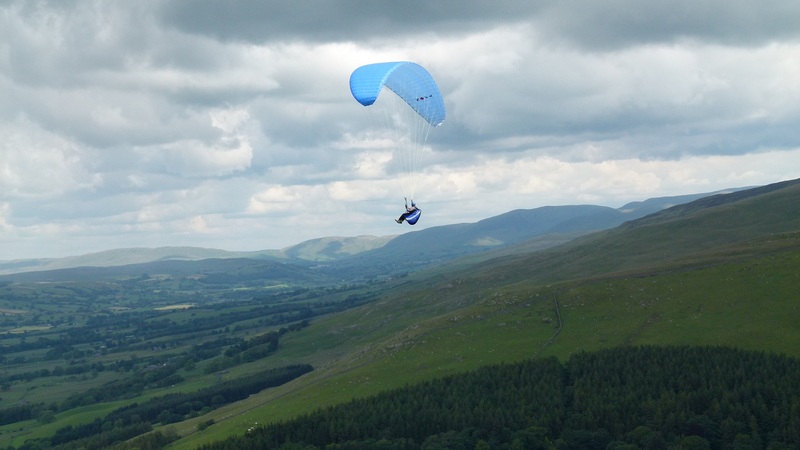 The western mouth of Barbondale is just below the photo and the Howgills lie to the north with the Lune valley to the left of the pilot. 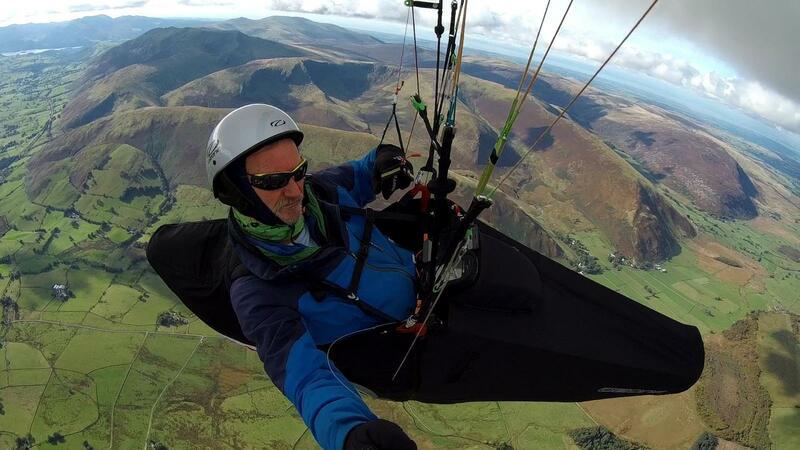 This month has seen 2 site records broken, both by Jaysen Metcalfe - Black Combe (West) and Barton Fell. When conditions are too strong, we go to the coast. On 4 April Gordie Oliver and Malcolm Grout flew at Lowca initially on paragliders and then on speed wings as the wind picked up. 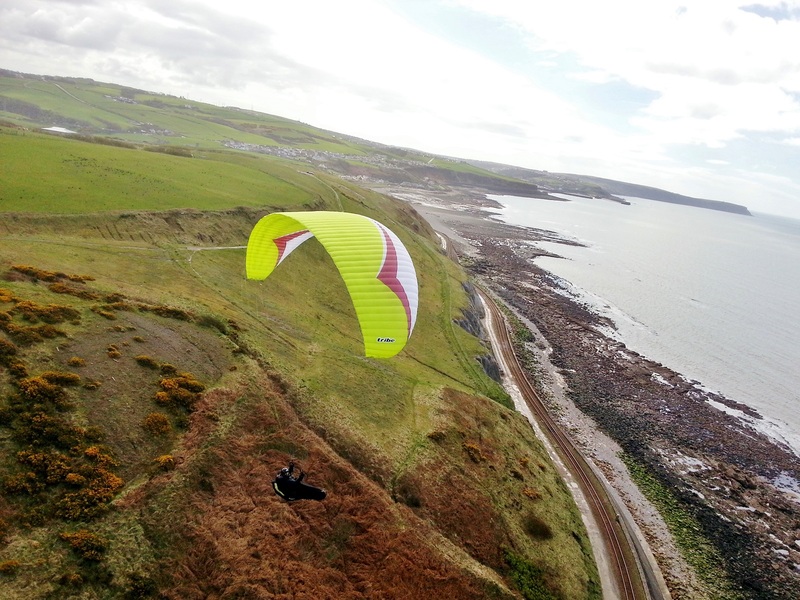 The view is to the south with Whitehaven harbour in the far distance and St Bees Head on the far right, The pilot is Gordie and the photo was taken by Malc.